Yes, but it’s okay for me to let the Anguisher come through. Ashlee Scheuerman grew up in Western Australia and spent much of her childhood role-playing as the Greek goddess Artemis. She could easily be found outside, grubbing about in the garden to make “food for the faeries” or observing and collecting local insects as temporary pets. Indoors, she fostered a love of playing video games, board games, and hide-and-seek, and building elaborate playsets for her favourite teddies. 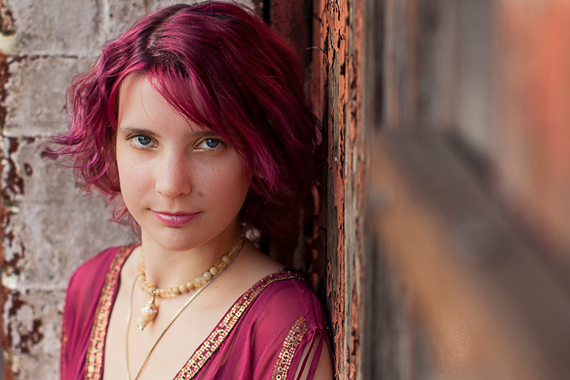 Reading started while still a toddler, and a library-loving family encouraged Ashlee’s passion for the written word until entering fictional worlds was almost second nature and she couldn’t help composing stories of her own. Even though she completed her homeschooled education and went on to independently study entomology and psychology, there’s little wonder Ashlee has embraced the author’s life. A great and wild amassment of books make up a personal library, now overflowing from the many bookshelves onto an e-reader. Paper and ink will always be her first joy. Ashlee collects anything presently fascinating. Long ago, the treasures were sea shells, foreign money, and Pokémon trading cards. Her interests have morphed to include gemstones, pine cones, and tarot decks in more recent times. She did have a brief stint at collecting paper clips found on office floors. Ashlee now has too many paper clips. Being an artist and creator leaves Ashlee with a sense of wonder at great truths and simple beauties with equal significance. She loves colour, texture, and sensations, spending far more time than is strictly necessary musing over exact descriptions of sensory input. Rainbow things are an especial pleasure. In balance to her ineffable optimism, her favourite songs are depressing and she revels in well-written tragedies. Ashlee still lives in the grandiose state of Western Australia with her husband and other family, human and animal alike. The stories she finds herself creating are fantastical with darker elements interwoven, and inevitably reveal her continued fascination with entomology and psychology. Ashlee has a short story in the award winning post-apocalypic horror anthology, Surviving the End (Dark Prints Press), and the upcoming science fiction anthology, Qualia Nous (Written Backwards), and writes when she can silence the allure of collecting more pine cones and other delightful treasures. Find some of the unusual combination of thoughts she holds about the real world at The Fane. You’ll find me there, a happy man. Ty Scheuerman lived his earlier years in the state of Ohio, where the environment was alluring for camping, cookouts, and hiking, and a wide variety of snow sports in winter. From building a massive tree fort alongside his childhood friends in the local forest, and frequent trips to nearby amusement parks, through to Halloween celebrations and embracing sledding season, Ty spent much of his youth invigorated by the possibilities of the outdoors. His attraction to art was often supported by an interest in comic books, animation, and computer software, all of which have given Ty as much inspiration as the work of classical illustrators, painters, and lithographers. An interest in high technology and computer programming melded well with the rest of his artistic endeavours, and beneath the veil of his home computer he began to tinker, designing software and training himself to think constructively. Next came an obsession with sound and music. He has been in a number of bands, and continues to write music when inspiration takes hold. He is self-trained in guitar, keys and as a vocalist, although he exercises the glut of his interest on the technical side of sound engineering, design, and production. During his spare time, Ty collects retro video game hardware, occasionally practices flatland inline skating, and still dreams of spending time on mountain slopes. With an innate passion for exceptional quality, practical philosophy, and creative problem solving, Ty can appear overly-critical, but his dedication to high-concept work proves the value of his thought process. He is always willing to have profound discussions about most subjects, whether physical sciences, politics and society, or the metaphysical. Ty moved across the world to live in Western Australia with his wife and their growing brood of pets, and laments the lack of “real winter” every year. He has been sharing his creative focus between illustrations and high definition artwork for The Damning Moths, recording his first finished, full length music album, and collaborative and freelance graphical work, sound design, and other concept consultations. Look over various sketches and concept work drawn by Ty, as well reblogged art he has found enjoyable at The Bad Hand. 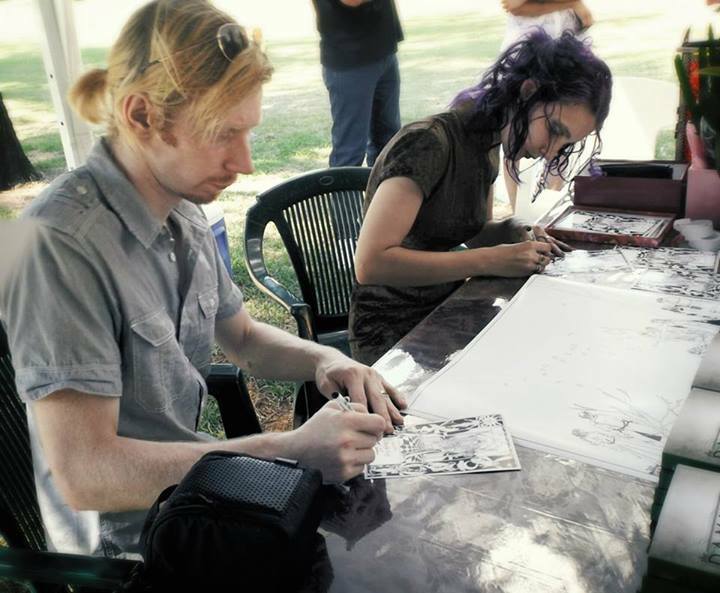 Ty and Ashlee signing at The Damning Moths book launch party, 17/11/2013.